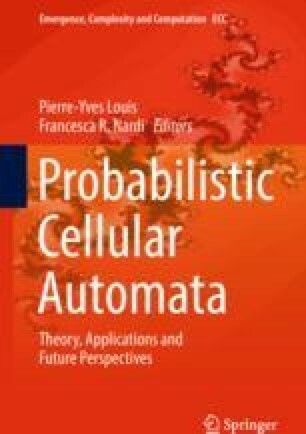 We present a method for computing probability of occurrence of ones in a configuration obtained by iteration of a probabilistic cellular automata (PCA), starting from a random initial configuration. If the PCA is sufficiently simple, one can construct a set of words (or blocks of symbols) which is complete, meaning that probabilities of occurrence of words from this set can be expressed as linear combinations of probabilities of occurrence of these words at the previous time step. One can then set up and solve a recursion for block probabilities. We demonstrate an example of such PCA, which can be viewed as a simple model of diffusion of information or spread of rumours. Expressions for the density of ones are obtained for this rule using the proposed method. The author acknowledges partial financial support from the Natural Sciences and Engineering Research Council of Canada (NSERC) in the form of Discovery Grant. Some calculations on which this work is based were made possible by the facilities of the Shared Hierarchical Academic Research Computing Network (SHARCNET:www.sharcnet.ca) and Compute/Calcul Canada. The author thanks anonymous referees for suggestions leading to improvement of the article, including a simpler derivation of the cluster expansion formula.